I’ve used the line before – but every now and then you open a bottle of wine that is just really special. It’s a wine that reminds you why you like wine, drink wine, read about wine, talk about wine, and visit wine country. I had an exquisite Syrah over the weekend that I’m still telling friends about after the fact. 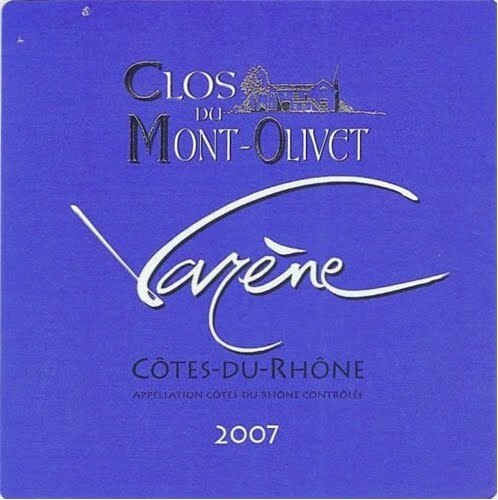 The wine was a Clos du Mont-Olivet 2007 Varene. It is 100 percent Syrah from the Cotes du Rhone region in France. The label is known for its Chateauneuf de Pape wines but this moderately-priced Syrah is memorable. It’s big, rich and beautifully balanced. You want more wine geek? I give you more wine geek. The Varene is an intence, black fruit wine that has strength and richness that combines for an elegant feel in the mouth. Still the spice, the tannins, the sheer power of this Syrah is beautifully intoxicating. There is an earthiness that reminds regular wine drinkers of the best Cotes du Rhone has to offer. The winemaker, Thierry Sabon, is hailed as one of the area’s best. Here is a blog post from the Watertown Press in Needham, Mass. The writer visited Sabon at the winery. I paid $23 for this wine at Vino 100 in Columbus, Ohio.